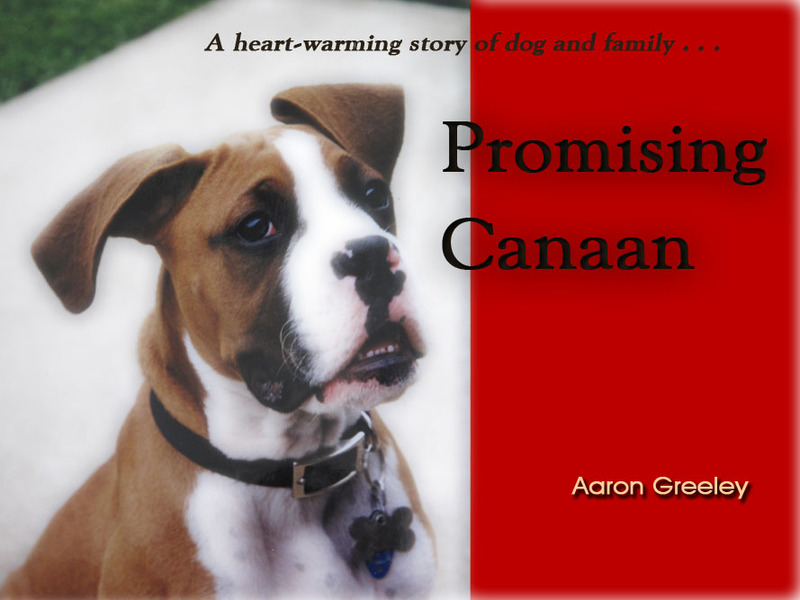 Promising Canaan passed away on August 24, 2011. As far as canines are concerned he was the best, and I have been around some of the greatest. Born on February 2, 2002 (also my birthday), Tracy and I made a rush to get to the breeder’s home late on a Sunday night after reading the classified add in the newspaper that day. 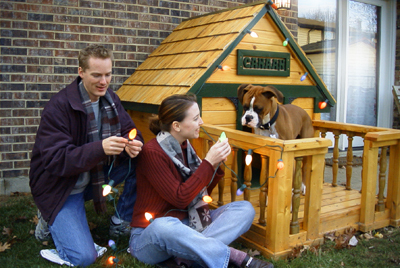 We had our hearts set on purchasing a boxer puppy for a few weeks finding it difficult to get to a reputable breeder before the puppies were claimed. So when we were the first to arrive this time we had the pick of the litter. Canaan stood out among his four siblings. He was the only one with white markings on his face, an important trait to Tracy. She was of the opinion that boxers with light markings on the face looked friendlier. He was also the largest of the litter, a point to keep in mind when training a dog to follow commands. 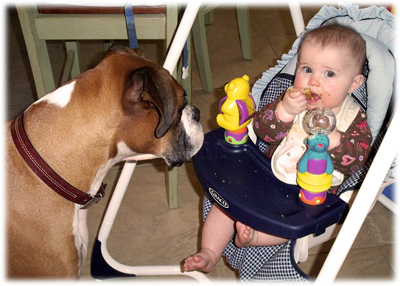 The larger dogs usually come with bigger appetites and thus respond to food rewards more readily. The owners had already named him Brutus because of his size. He liked to bully his way in to get to his mother’s milk, easily swiping aside his three sisters and one brother in blind desperation. But Tracy and I had already decided on two names; Rupert or Canaan. 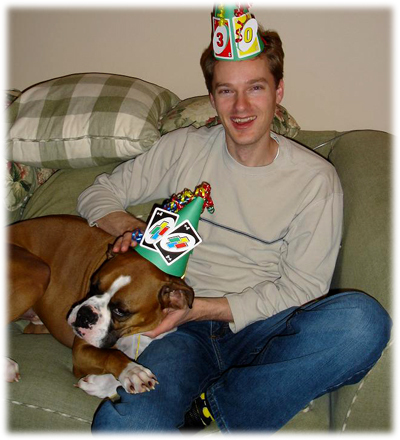 I liked Rupert because it is a goofy name and the boxer breed is renowned for clownish antics. However, Tracy and I knew right away his name was Canaan. Tracy and I had prayed about this dog, asking the Lord to bless us with a dog that would befit our family. We actually preferred to use a Biblical name out of respect for the One in control of it all (a tradition we continue with our children Noah, Josiah, and Gloria). But it had to be a name that would not be normally used for a child. A name that is original and intriguing. Canaan means strength. Even though his mother was petite as boxers come, we were blessed to spy a photo of the sire; a strapping 85 pound bulk of rippling muscle. He stood tall and mighty, as I would picture Samson the judge. Canaan was a fitting name by itself but that name carries significant history as well. I did not want him to be considered in the light of the Canaanites of the Bible, a people cursed from the days of Noah, who would come to be wiped off of the earth by the Israelites fulfilling God’s judgment. The land of Canaan was rich and bountiful. It was the Promised Land. Canaan was a symbol of God’s faithfulness and generosity. Even for Christians today we await a new Canaan, the promise of heaven. Promising Canaan has a bright and noble ring. It sounds like a name for a racehorse. Promising is a participle, giving the name a sense of possibility and life. Because the participle is adjectival, there is also an accompanying sense of the hopeful and prophetic. Even though he was a large puppy compared to his siblings, Canaan would more resemble his mother. Tall like his father and boasting firm muscles, he was thinner and more toned. The photo of his father showed the owners with clenched fists holding on to a leash around his neck. But Canaan’s mother Brandi was sweet and calm for a boxer. She fancied myself, standing in my lap as I sat on the floor next to the puppy crate. This was unusual for her. According to her owners, she was skeptical of most men. I took it as a blessing from Brandi that this would be a good relationship between her son and I. Similar to his mother, Canaan’s face was defined by a white blaze on his forehead and a somewhat crooked white bowtie shaped spot on the back of his neck. In fact, in later years our children would call it a lightning “bolt”. And wow could Canaan bolt! One of my favorite games was to ask Canaan to sit on one side of the park, as I would walk away. After walking to the other side, I would suddenly break running away from him. Instantly he gave chase. His long legs and powerful muscles glided effortlessly over the grass. He looked more like a deer when he leapt. At full speed he floated over the ground, his legs a blur. It was fascinating to see how long it would take him to catch up. A few seconds at most and I was dodging a freight train without brakes. That was one of the remarkable things about Canaan. He was obsessed with being close to my wife and I. With hawkish eyes he tracked my every move if he sensed we were getting separated. Sometimes, I would take him on car trips to pick up pizza. I parked in front of the store, walked inside, and inevitably returned to Canaan perched intently staring at me from the front seat. He watched me inside the restaurant all the way back to the car door as if he was assuring I would make it back okay. I guess it started the first night we brought him home at six weeks old. We were devoted to crate training. So Canaan found himself unbearably lonely, whining classically all night long until I couldn’t stand it anymore. I slept in the kitchen next to the crate with him in my lap. The next morning, Tracy and I went to church and left Canaan confined to the kitchen where he had the choice to sleep in the crate or wander about and piddle on newspaper on top of the tile. Of course he yelped in protest as we left. After church, Tracy and I came home and peered into the window to see what he was up to. Our hearts raced as we realized he wasn’t there. He had pushed aside the crate and bags of dog food that were blocking access to the rest of the house. We burst into the house calling his name. “Where are you?” No sound, nothing. We searched and quickly found him nestled on top of a pile of dirty laundry in our bedroom, quite content to just rest. He found our scents in the laundry and curled up for his first peaceful rest. Eventually, earplugs solved our nighttime sleeplessness and Canaan was crate trained appropriately. Hide and seek became one of my favorite games as well. With Canaan sitting in the bathroom on one side of the house, I would try to find a hiding place. My special whistle signaled him to search for me. He was a desperate seeker: frantic, running, sliding, sniffing until he laid eyes on me. He had found me; everything was all right once again. Canaan loved to look at me right in the eyes, as if he wanted to have a conversation. “Are you listening when I talk to you?” my wife asks of me. Canaan never had that problem. He stared intently when I looked at him; his mind was at peak concentration. If I spoke or just made a noise and he tilted his head to one side and then the other until I looked away. I never won a staring contest. He was too focused on what I wanted. However, he communicated to me on occasion. What is he saying to me? What does he want? If he stood right in front of me and stared, he was saying, “Please, may I have food and water.” Quite picky about his water, he would continue to stare if I didn’t give him new water in his bowl even though it wasn’t close to being empty; a prima donna in this category. Another way he communicated was with his head bowed, ears tucked back, and tail pointed down. Oh, Canaan! This is how we were greeted upon arriving home after Canaan had done something he knew he shouldn’t have done; eating the cooked chicken on the counter, busting the flower pots in the backyard, digging out the down spout, sleeping on his favorite couch. Most of these were in his puppy years. But the couch was really his persistent weakness. Nuzzling the pillows off, he made a space and curled up for a nice nap. He always left a little fawn colored hair behind on the chocolate fabric that drove Tracy crazy. He knew he would be punished and he effectively told on himself every time, but he couldn’t stop sleeping on the couch (unless the laundry basket was on the couch; he was deathly afraid of the laundry basket). He did these things when we left and we failed to put him in the crate: never when we were around. I’m sure we would never have noticed some of these things right away if he hadn’t told us when we walked through the door. We knew we must start a search for the evidence. It’s nice to have such an honest friend even though he wasn’t perfect. Canaan often joined us in front of our house for yard work, our unfenced yard hardly a temptation. If something out of bounds caught his eye he would quickly stand up as if preparing to lunge forward. But usually he never budged. If needed, one word of reminder was enough and he stayed put. I have never been around a dog bent on being so close to us that he refused to wander away down the street or chase after someone crossing the sidewalk. We have accidentally left him in front of our house multiple times only to wonder later where that whining sound was coming from. It was Canaan at our front door asking to come back inside with us. 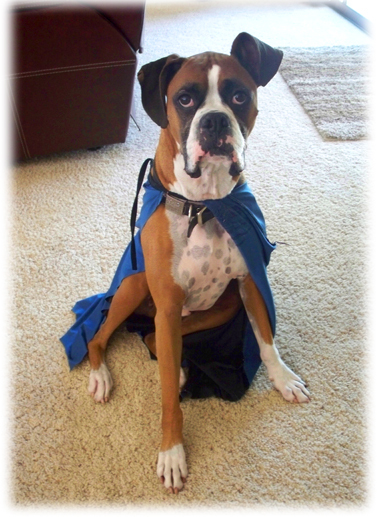 Typically boxers are silly personalities, maybe a little dopey. But if one word described Canaan it would be, attentive. 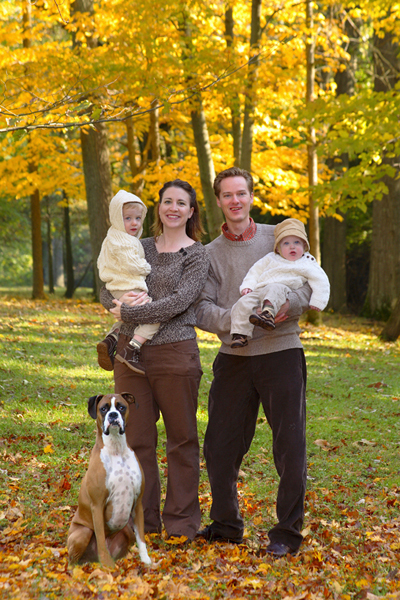 Early in the morning on Labor Day, September 6, 2004, my wife suddenly awoke with a sharp pain in her stomach. I was working the night shift on that occasion. Tracy wandered to the bathroom with Canaan right behind. My wife’s water broke and she started labor at that moment. Canaan didn’t typically follow us into the small bathroom because it was too cramped. But on this occasion he stood by her, laying his head in her lap. 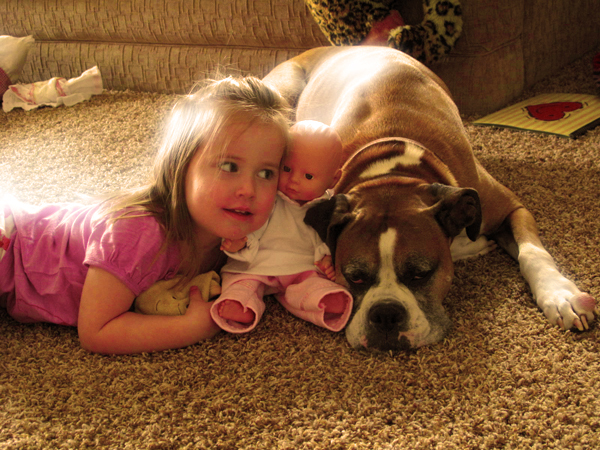 One never knows how a dog will react to a baby. So we took precautions to make sure everything was safe. I remember bringing our first son Noah home and taking off his bonnet to let Canaan sniff. He was very excited and extremely curious but never threatened. Noah’s little baby cry was quite disturbing however. If Tracy and I were busy and Noah would start to cry from his crib or the swing, Canaan paced back and forth from Noah’s room to us until we paid attention and took care of the problem. Well, as children grow and the cries become louder and more frequent eventually Canaan’s interest in that noise subsided. I guess he knew that we would take care of things and a dog can only take so much racket! Canaan had a sense of politeness about him. 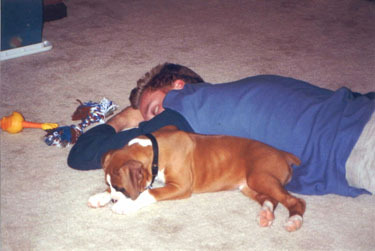 He lay quietly on the carpet in Gloria’s room as we sang her to sleep at night. Tracy or I would sneak out of the room and close the door gently behind us. Later in the evening, maybe hours, I wondered where Canaan was. Sometimes I heard a very faint whining again, only to discover we had accidentally trapped Canaan in Gloria’s room. But he would never bark or wake up the baby. On occasion he would bark if he heard a strange noise outside or if he wanted to be let in from the back yard. But he never barked while in the room with a sleeping child though he had several opportunities. At 75 pounds he could have gotten his way more often. It made me nervous watching him dart in and out of the door when the children were trying to come in or out. But he never knocked them over. This fascinated me. Even in his last week of life, he darted out the door at the same time a friend of ours was helping her toddler walk outside. It happened so fast before I could say something to him. He surely would have waited politely if I had reminded him. But even so, Canaan didn’t knock anybody off balance. He was agile and conscious of those around him, never taking anyone’s knees out or running over a kid to get somewhere. In fact, he would stop dead in his tracks if he saw there would be a collision. He had great poise not to injure those around him. Canaan was gentle at heart. Every other dog his size and with that kind of energy wouldn’t have blinked an eye or even noticed the child they had just bowled over. He loved the children as his own. Whether dressed as a superhero in a cape or serving as the princess’ noble steed, Canaan hardly complained. On occasion he took shelter at my feet begging for reprieve and deservedly so. But for the most part he liked to be present amongst all of us. When Noah was a baby playing on the blanket on the floor, Canaan would scoot up close until he barely got his front paws onto the blanket. He knew Mommy wouldn’t accept him lying on the blanket with the baby. So Canaan would just stick his flat nose and fat jowls out onto the edge. He loved to be in the mix. It wasn’t as if Canaan didn’t love to have fun. Actually, he was quite animated. When people came to our house he became very excited. His wiggling nub of a tail was an excitometer. He wiggled so vigorously his entire back end wouldn’t stop moving. He loved to walk outside with us and play with toys. The goofier the names we came up with for his toys the more excited he would become. “Big green frog,” “multicolored spikey ball”, “squeaky hamburger”, “chewy alligator”, “yellow squeaky spikey donut” to name a few. One of the first toys I made myself. Canaan needed to run but he wanted me to run too, and well, that didn’t last long. So I attached a tennis ball to a long string and helicoptered the ball over my head fast enough to be just out in front of Canaan. Divots of grass flinging in the air, his legs tried to make the turns as fast as he could. Eventually, traction failed and Canaan spilled over after reaching a certain speed, only to get up and try again until he nabbed the ball. In his younger years, tug-of-war was his favorite. He loved to thrash back and forth trying to dislodge my grip. If I could muster the strength, I would lift him off the ground by pulling up on the rope in his mouth. He became more sophisticated later on after a few of those teeth were fractured. One of the first things I bought him was a tiny tennis ball, puppy-sized. It barely fit in his mouth when we brought him home at six weeks old. I was determined to make him a retriever, though unnatural as boxers go. He did fairly well fetching the ball, but I think he knew there was something we would come to enjoy even more. The Frisbee is a much more elegant device. It is not as erratic as a ball, and its flight pattern is gentler such that it could be caught more easily. Wow, what fun it was to watch him run full bore and swipe one right out of the air; much more exhilarating than fetching the ball repetitively. I have him to thank for helping me rediscover my earlier passion of disc sports, such as Ultimate Frisbee. Honestly, I have a lot more to thank Canaan for. There is a big hole in our family now, but our family is a lot fuller because of Promising Canaan. He has been teaching me important truths from the beginning. I taught him stay, sit, come, lie down, box, “Bang! Bang!” (play dead), roll over, and bow. He taught me how to be attentive to my Master (intent, unwavering, close); how to be obedient (responsive, respectful); how to be accountable (transparent, humble); how to be caring (engaged, aware); how to be a friend (loyal, true). Thank you Lord for my companion!